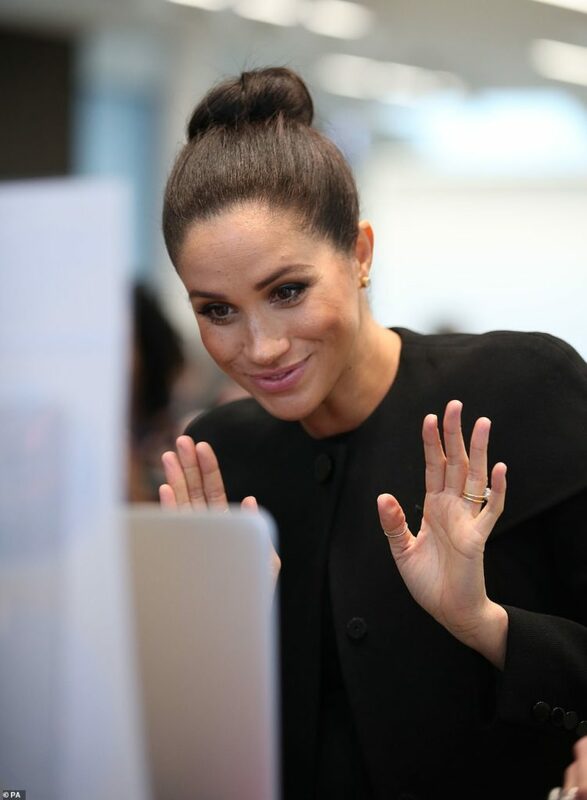 For her second solo appearance last week, the Duchess of Sussex visited the Association of Commonwealth Universities at the City University of London on Thursday, January 31st. This visit comes after the announcement of her newly-appointed royal patronages, of which the Association of Commonwealth Universities is one! On this particular visit, Meghan met with faculty, students and the organization’s staff to learn more about the network of universities. For this visit, Meghan kept things sleek and simple in all black. This Givenchy cape-coat is a repeat – you may remember her wearing it on Remembrance Day back in November? She styled it with a bepsoke Givenchy pleated dress, featuring a flowy handkerchief hem. To break up the black, Meghan chose a classic pair of Manolo Blahnik BB pumps in beige suede. This pump style is certainly one of Markle’s favorites, as she’s been seen in this exact shoe in a variety of colors multiple times in the last year! I don’t blame her either. They are sophisticated, leg-elongating (aka flattering) and comfortable! Neither her coat nor her dress are available to purchase, but I linked some similar pleated skirts and coats below for you to recreate her look at the bottom of this page. Meghan has also been getting a little more creative with her hairstyles lately, which has been super fun to follow! For this event she went with a polished high bun. Since she normally leaves tendrils out, this was a nice change of pace. I’m sure it was fuss-free for her too! See more photos from this event and shop Meghan’s outfit (and dupes) below!